A restaurant in Sydney will reward their customers with a free glass of wine if they can give up their mobiles and go offline for the duration of their meal. Contact Bar and Kitchen has introduced the new move designed to ‘force’ people to connect as its name suggests, Business Insider wrote. So far, the restaurant’s owner has reported a 100% success rate. But, he continued, people quickly got over it and conversation quickly flowed. “They love it,” he said. This is not the first restaurant to give customers incentive if they can put away their phones during meals. 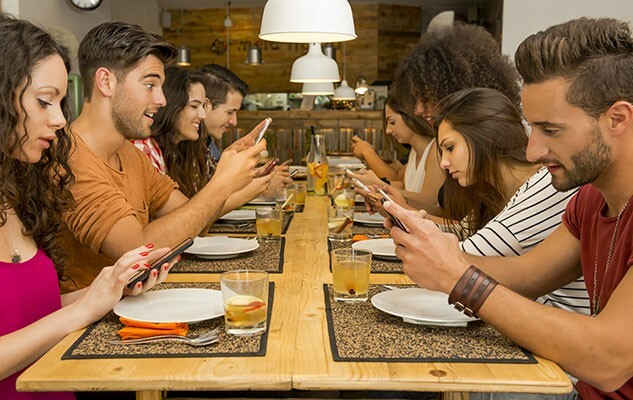 Restaurants in the US and Israel have been reported as offering up to 50% off the price of a meal if diners are able to keep their phones in their pockets – or even locked away in a box for those who really can’t help themselves. Meanwhile, restaurants in Japan have gone completely the other way by inventing what’s known as an ‘anti-loneliness ramen bowl‘ that features a phone dock on the bowl for dinners to rest their phones on while slurping ramen noodles.